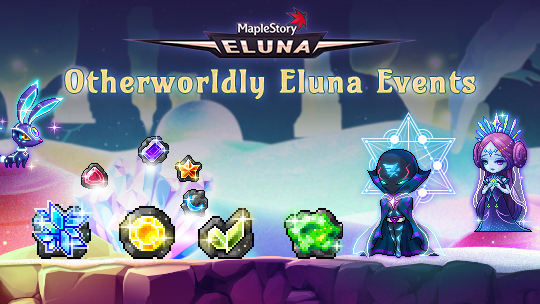 The planet Eluna brings many events and rewards to Maple World! One of the events is the Ryuul, a highly-advanced space-faring race, which share twinkly Elunarium ore to adventurers. With enough Elunarium, you earn buffs and receive Otherworldly Luck when your character revives after dying. Players Lv. 33 and above can begin the event by accepting the quest 'A Powerful Energy and Elunarium that Crashed on Maple World' from the event notifier on the left side of the screen. "Hunt monsters within your level range (10 levels below and 20 levels above) and you may discover Elunarium ore! There are eight different types of Elunarium, each with its own special ability: Elunarium (Weapon ATT/Magic ATT), Elunarium (Skill EXP), Elunarium (Boss Damage), Elunarium (Crit Rate), Elunarium (Ignore Enemy DEF), Elunarium (Crit Damage), Elunarium (Status Resistance) and Elunarium (STR/DEX/INT/LUK). Accept the quest ‘[Event] Obtain the Elunarium Power’ to open the buff UI. Depending on how much Elunarium is currently in your inventory, you will receive different Elunarium Power buffs that last for 1 hour. Each buff has six different levels. • Hyper Teleport Rock: 1-day duration. • Pendant Slot Expansion: Untradeable, 1-day duration. • Mr. Wang's Storage Wagon: 1-day duration. • Miu Miu the Merchant: 1-day duration. • 2x Drop Coupon (15 min): Untradeable, 14-day duration. • Special Medal of Honor: Untradeable, 14-day duration. • Elite Monsters appear more frequently. • Elite Monsters drop a maximum of ten reward pouches that can be used daily. • Runes appear more often and the rune cooldown is reduced. • A rune EXP buff effect enhancement has been added. • You can carry out a maximum of 6 Surprise Missions daily. • The portal for Pollo & Fritto appears more frequently. • After defeating Inferno Wolf, EXP gains increase by 100%. • A boss party buff effect enhancement has been added. If your character dies during the event period, there is a chance to receive Otherworldly Luck from the Ryuul when you revive! If Otherworldy Luck activates, you will receive the effect of one of three random buffs: Buff Freezer, Respawn Token, Safety Charm.